What You Need To Know About Varicose Veins Medical Malpractice: What Can You Do When Something Goes Wrong? If you’ve decided to make the change to contacts, you’re probably feeling a mixture of anxiety and excitement. While glasses can work well when it comes to improving your vision, depending on your lifestyle, contacts can be a better choice. While you will learn to love your contacts, at first, it’s natural to struggle with them. However, with the right approach and knowledge, you can make sure that adjusting to your new vision aids takes little to no time. To make the adjustment process easier, here are a few tips. Take these on board and you’ll find adjusting to your new lenses much easier than you thought the process would be. Whatever you do, don’t go about swapping to contact lenses yourself. You might know your glasses prescription, but that doesn’t mean you know your contact lens one. You see, contact lenses have to be fitted to your eye shape. It’s not just a case of thinking about your prescription. That’s why it’s so important to see you optician before swapping to contact lenses. So that he or she can recommend the best ones for your eyes. Your eyes will be measured, and your optician will be able to tell you what lenses are suitable. Before you decide on a certain lens, it’s a good idea to trial a few different ones. Your optician will probably give you a selection of lenses to try out so that you can see what works for you. These will mostly be daily lenses, as these are the easiest to use. Compared to two-weekly and monthly lenses, dailies are much easier to care for as they don’t need cleaning. However, you can ask to try lenses that last for longer, if you want to. Once you have tested out your lenses, you will then be able to order some. You can do this through your optician, or to get some decent deals have a look online. Often, ordering your contact lenses online can save you money, so it’s something that’s worth looking into. Don’t make the mistake of going from glasses to wearing contact lenses 12 hours a day. Else, you’ll end up with sore eyes. 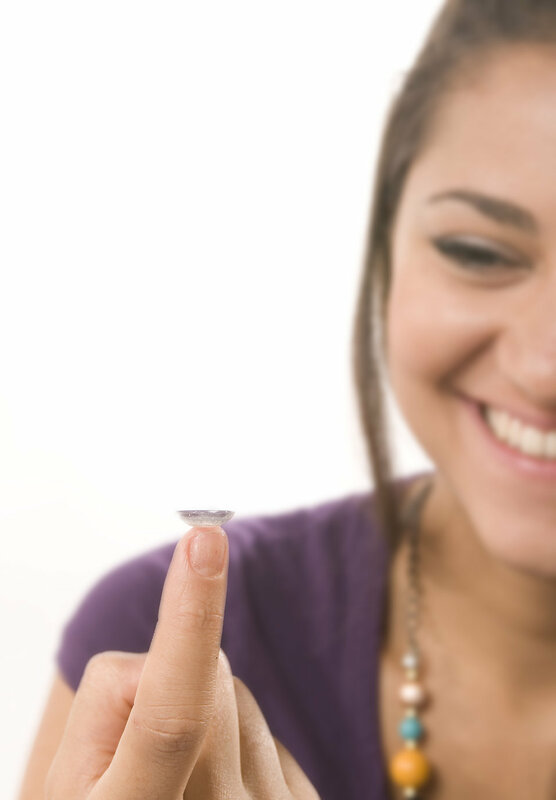 To make wearing contact lenses comfortable, it’s important to slowly build up how much you wear them. Start off by wearing your new lenses for just half an hour, then build up to a couple of hours. It will take time, but within a week or so, you should be able to wear your new lenses for eight hours before they start to cause irritation. You may find that after a few hours of wear, your contact lenses start to dry out. This can cause your eyes to become sore and irritated. To prevent your lenses from drying out, opting for ones with added moisture is a good idea. You can also invest in hydrating eye drops that can help to ensure that your lenses don’t dry out. Just make sure to select a solution that is contact lenses safe, as some eye drops are not. If you’re confused, ask your optician for advice on the best drops to use. Making the swap from glasses to contact lenses doesn’t have to be stressful. Take the above tips on board, and you can make the process of swapping to lenses as easy and stress-free as possible.